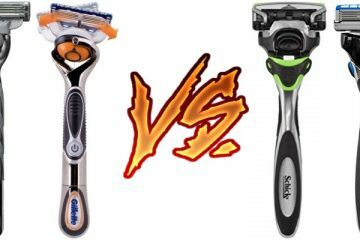 Best Disposable Razors in 2019 Ranked! An ideal razor is an integral part of our shaving routines. Make no mistake, there are plenty of shaving tools around with varying prices. Most of them are above average. Yet, I don’t advise people to go with straight razors or cartridge ones unless they have the time to spare. Instead, I’m for the best disposable razor that has numerous benefits. You get them at a cheaper price. Handling these babies is less of a hassle than their cousins. Also, cleaning them is no fuss at all. In fact, if you are done utilizing the blades to their full potential, you can even throw them out. Even with all these perks, finding the best in the business is still a challenge. With numerous products and parent brands into the business, one will find it tough to hone in on just the one candidate. That’s where my article comes in. Here I’ve looked into seven of the top disposable razors in the business. You’ll find in-depth reviews on features, benefits, and the handling routine. For all you picky folks, there’s a buying guide tucked in there. Look through my lenses and see which factors I prioritized when selecting these models. Let’s hop on to the ride. As it stands, the market is flooded with different brands and numerous products when it comes to disposable shaving tools. Selecting “The One” is already a difficult task. I’ve made an attempt to lessen the burden on people by referring some of the top brands in the business. I know, disposable razors are meant to be one time things. I get that. But then again, why compromise with quality and settle for anything less than the best? Hence, Gillette Mach3 Disposable Razor it is! Worried about the irritations these razors cause? Don’t be. The Mach3 comes with blade guards. The makers have aptly named it “Microfin Skin Guard.” This thing prevents the blades from pulling our skins and causing abrasion, nicks, and cuts. Then, you have the lubricating strip. This little strip consists of a special gel that does what it’s good at. That is, lubricating the face of ours. This comes handy when users want to drive the razor with minimal friction. Thus, this thing cools the skin and minimizes razor burns when people are through with two or more passes. Gillette Mach3 has an apt name for its blades too! It uses DuraComfort™ blades. I found these blades aligned at a perfect angle. This helps to cut more facial hair than normal ones. With three blades, one pass counts as three for the users. You Need fewer passes for your shaves. That translates to less irritation. Furthermore, these blades come with DLC. No, not like the DLC in games. Rather, it’s “Diamond Like Coating.” This is the reason which makes blades strong. And enables them to cut close. You’ll not find the odd hair surviving the onslaught while you touch your face the next time. Oops! I almost forgot about the handle. As is the case with disposable razors, the handle is weighted to grant users apt support while stroking their faces. The ergonomic handle is perfectly balanced as well. Despite how it looks the blades are easy to clean. One can conveniently rinse these blades thanks to their “Raised” design. The blades have a 30-degree resting angle with the handle. One pass is enough to cut it clean. Surprisingly, I didn’t have any nick or cut to show for my first shave which is great to be honest! It is the perfect tool for people who have medium beards. The shallow angle suits them perfectly. The handle is ergonomic. One can expect swift movement thanks to the grip system. Three blades and the “Diamond Layered Coating” system work hand in hand to deliver comprehensive shaving experience. The blades need a bit of breathing time. Day-to-day shaving will cause them to wear out faster. If you are new into disposable razors, I’d suggest not using these since these are not for beginners. Did you seriously think Bic would fall behind when it comes to best men’s disposable razors? I surely didn’t. This one comes with a punch. To be honest, ten punches. One package comes with 10 razors with sleek blades. As a result, buying one is essentially reassuring for at least 3 months for regular shavers. Bic gave the razor a single blade. I know, many of you will frown at the idea. But it works! The single blade comes with a protective skin guard. The blade works well to shave touchy areas. The skin guard does its part by lifting your hair and preparing it for the blade to cut. Teamwork at its best! Did I mention that these blades come from polished stainless steel? I guess not. Well, now you know! I loved the fact that Bic provides a sharp blade and a guard with a handle at an affordable price. This blade is perfect if someone wants to cut medium beard of his. So, how good is the handle? Well, I can tell you that it’s longer than others on my list. The razor is lightweight including the handle. It makes gripping it easy. People can move it around to their liking. On top of that, the handle is grooved your fingers and knuckles won’t be tired after shaving. I travel a lot during vacations. For me, this razor is perfect! It takes negligible space in my backpack. This being a disposable, single-blade razor, is approved by TSA. So, no problems carrying out of the state for my grooming routine. Also, it comes with the opportunity of 100% refund if people aren’t satisfied. 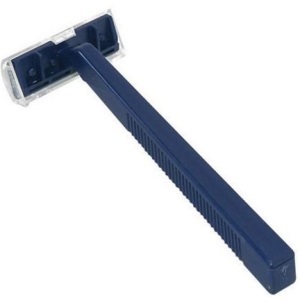 This razor is lightweight, people can maneuver it across their faces comfortably and easily. I love the single blade. It enables me to get close to stubborn two-day-old stubble of beard. There’s a thin bar that raises the hairs when cutting. It protects the skin from nicks and cuts. Thin razor head adopts perfectly to our facial contours and hard to reach areas for a close cut. You have 10 packs of travel-friendly, TSA approved razors at a measly price and money-back guaranty. So, no complaints. 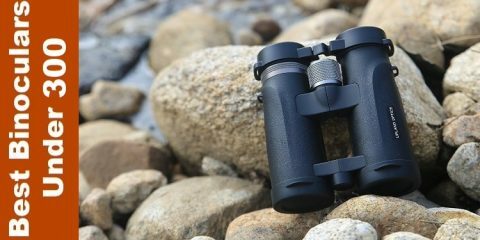 I didn’t come up with issues while using this product for a short review in this article. Gillette is too big and famous of a company for me to include “Just One” razor on my best Disposable Razors’ list. So, here’s another one. Let me tell you right off the bat, there’ll not be any lubricating strip on the razor head. But with Gillette Good News, people get as many as 30 razors in a pack. To be honest, people won’t even miss the lubricating strip. This is all thanks to the razor head. This head moves ever so slightly. That alone is sufficient for this product to adjust with our facial contours. Thanks to this, people will suffer from fewer nicks, cuts, and skin tugs. As opposed to Bic’s single blade, this razor has two. These two blades are thin and sharp. I’m quite sure people have heard this from numerous disposable razor reviews. These two blades deliver “Twice as Close” shaves with a single stroke. If you think that this is pretty much the end of its perks, you’re mistaken. The thin and sharp blades can cut through rough and tough beard types. If you are looking for a way to shave the medium-height beards of yours, try this razor for a change. It didn’t disappoint me. Getting away from the blades for a moment, the handle is a good addition too. It’s a long handle with the textured gripping system. I don’t need to tell people how easy it is to grip and maneuver this thing around. People might complain about the handle being feeble and thin. But let me tell you, it’s durable. At a price below $15, one hardly expects a quality shaving experience. But to my surprise, it was. And 30 razors go a long way in saving my money. I miss the lubricating strip but use quality bay rum aftershave to numb the skin irritations if there are any. It depends on how one handles the razor and shave in the long run. You have a moving razor head at a price no one would believe, it’s a definite plus. 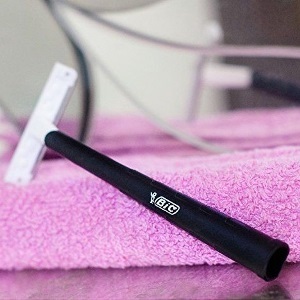 Textured handle gripping system allows for a hassle-less shaving experience day in and day out. 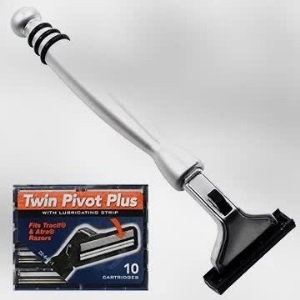 Twin blades help people complete two passes by the time others make one for shaving. This shaving razor works well for tough and medium-length beard that’s three days’ old. At a fraction of a price, you’re getting as many as 30 razors which is great in its own right. I missed the lubricated strip in the mix. It would have helped in lessening the irritation for beginners. Want a “Lifetime” supply of disposable razors that can stand up to the money you pay? No, the company won’t send out heaps of razors to us indefinitely. But you get 300 pieces of razors part of a package with less than $120 which is a great deal in itself! What else does it take for it to be the best disposable razor for 2019? Well, the blades are nice and they work as advertised. These twin blades are thin and can cut down coarse beard of a person. Even if you don’t have all that facial hair, I promise the blades will perform as they are meant to for sure. Considering the price, the makers have also put in a plastic blade guard to shield the blades from harsh environment and moisture. This is great. Even if people are done shaving, they can keep the blades safe. Just a word of warning, the blades are designed in a unique way. If people don’t handle it well, these blades can fall on their faces at a weird angle. Nicks and cuts will be pretty common. I won’t advise amateurs to careless use these products. Clearly, it is meant for the experts at the job. I’ve heard my neighbor say that these things are sharper than the blades Bic presents us with. Also, one blade lasts longer than Bic. I could get a week worth of shave from a blade. With Bic, it was three or four days of shaving. If you want something that’s cost-effective, this is it. The handles of these razors are great as well. One can grip the handle just fine considering the textured body of the handle. Trust me, the handle is anything but fickle. One or two accidental drops won’t put a scratch onto this shaving tool despite what others may think. 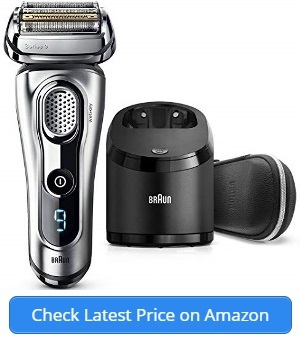 You get 300 razors at this price. It is a great deal no matter how one looks at it. People have two blades with this razor. This makes Mt better than Bic in performance. I love the “Squared” handle. It’s lightweight and provides a better grip than my stock razor. You have a plastic guard protecting the blades from environmental hazards and accidents. 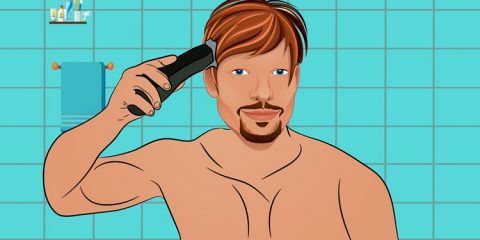 If you don’t handle the razor head and blades carefully, prepare for some nicks and cuts. Like the “Ever so Tasty” burger, all good things reside in the middle. The same thing applies for my article on best men’s disposable razor. As you can see, I’ve crammed Dorco Pace 6 blade razor blade system in the middle. Why? Well, it’s a “Six Blade” razor system with a bunch of perks that I’m dying to get into. You guys must have noticed that I’m speaking about a razor system that comes with six blades. In fact, Dorco Pace boasts the world’s first 6-blade system at its disposal. These blades are positioned at a comfortable angle on the razor head. Thus, one pass makes it so that people get the closest of shaves. I’m not kidding! One pass from this razor is equivalent of six with normal products. I could finish shaving 15 minutes earlier thanks to the system. These blades are coated with anti-rust substances. The patented angle allows for quick cleaning and less irritation. Nicks and cuts? These are yesterday’s news. I guess I have to elaborate a bit more on “Less Irritation.” You see, Dorco Pace gave this product a unique lubricating strip. The strip contains a combo of Chamomile, Olive Oil, and Allantoin. Among these, Chamomile soothes and moisturizes the skin. Olive oil is there for moisturizing. The last component is basically an “Anti-Oxidant” that rejuvenates facial skin. Does that mean Dorco Pace is the ideal brand for people with sensitive skin? Yes, it is! I’m not saying this basing my claims purely on the lubricating strip. In fact, this razor system comes with large fins that guard our skins against nicks and cuts. The ergonomic hand is easy to grip. Thanks to these fins, gliding over our faces is as easy as cake! To be honest, the tilting head plays a huge part in this act. The head adapts well to our facial contours. When I say, “You’ll not feel any bump and see reddish marks on your face,” I mean it! Dorco Pace offers a good value for the price as well. You get as many as 10 razors with one purchase. This is essentially a 6-month supply for me. You have as many as six different blades to take care of the “Shaving” business each morning. Ergonomic, “Rubber-Grip” handle makes it a breeze to grip the razor and operate with it. Each of the blades is rust and weather resistant for the users’ convenience and preference. It is the perfect razors for users that have a sensitive skin thanks to the lubricated strip. You have a skin guard that lets the razor glide smoothly over your face and prevents bumps. I’m impressed that Dorco Pace provides 10 razors as a package that goes on for months. These blades will cost you more money than many of my recommendations on this list. If you are amazed by 30 count or 10 count razors from some of the best in the business, Bump Fighter is here to shock you. 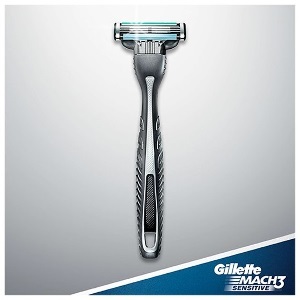 You’ll have as many as 48 razors within a single package when buying this product. 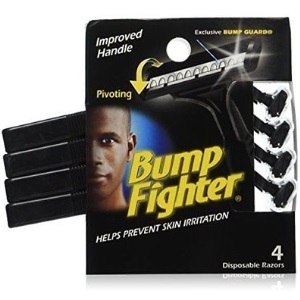 I included bump fighter disposable razor in my disposable razor reviews because it takes care of coarse facial hairs. This little product is made for tough and strong beards. For all you African-American folks out there, this thing can be a life-saver and a companion for life. Mark my words. Why do I say so? Well, the blades on the razor head are sharp. These things can cut through the toughest beards like a knife on butter. When it comes to ingrown hairs, the blades prove their worth as well. Despite how people visualize disposable razors, Bump Fighter’s blades won’t harm our skins. I need to mention that the razors give you a close shave. Why? Because each razor has just the one blade. This helps to get close to our facial hairs when the blade needs to. There is a blade guard that protects it from gathering hair follicles and hairs that may hinder the cleaning process later on. The blade guard allows the razor to glide smoothly over our skins too. Thanks to this, the skin won’t swell while shaving. Not to mention, it won’t get pulled by the blade. So, you won’t see any red spots after the shave routine too. Adding to that, the razor comes with a conditioner to sooth the skin. I like the handle too. It’s textured for easy gripping. The shave is nice. My guess is, it’ll fit all sizes and shapes of palms people commonly have. A great deal for African-American brothers of mine. So, how long will one product last? This depends on how frequently you shave actually. I know some shavers that claim one pack got them over the six-year mark. Yes, you read that right! Six years! It’s safe to say one product will get people through one year or more if they’re frequent about shaving routine. A durable razor with a sleek design is always a welcome addition in my “Shaving” arsenal. The blades of this product are high-quality. They serve for months without giving in to dullness. One blade per razor gives users clean and close shave that they desire each and every time. There’s a blade-guard that makes razor’s motion bumpless preventing nicks and cuts. I like the textured handle that makes gripping it easy. Also, it’s easy on the palms. I like how it takes care of ingrown and tough hair on the rough skin of African-American people. I didn’t find any fault with this little product. As we get down and dirty with my best disposable razor recommendations, I have the mighty “Safety Razors” product that’s compatible with persona and Gillette Astra blades that are top class in their own right. Just to get you into things, this is a heavyweight razor that combines double-edge and disposable razors in a unique way. To be exact, this “Chrome” razor weighs around 3 ounces. This is heavy when you consider moving it around your face. But the unique two-blade razor manages to pivot and do it easily. Plus, as I mentioned, it goes well with Gillette ASTRA blades and Persona blades that are in high demand. You get 10 refills along with the standard razor. These two blades work twice as better as any one-blade product would do. I can vouch for the shave’s quality. Thanks to the heavy handle, these blades effortlessly go through your facial hair. The handle makes gripping and maneuvering easy as pie for the pros. Polished chrome and the bulge at the middle play a big part in that. Towards the bottom, you’ll find engravings that prevent sliding of the razor when it’s wet or one’s shaving too quickly. We have a thin lubricating strip that works well to counter razor bumps and make razor glides smoother than normal. Comparing it to “Cheap” plastic razors will be a mistake. This one comes on top by a long shot. Plus, you have “Persona Blades” as refills. Who could complain? Not me. Want more? You can get a razor stand if you shed out extra bucks. Keep it on the bathroom sink or mount it on the bathroom wall. It’s completely up to you. This way, makers made sure that the razor has a resting place after shaving and proper maintenance. 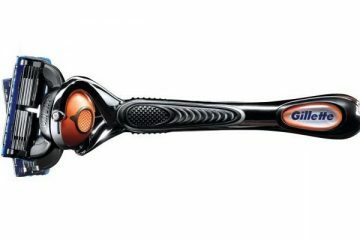 A chrome-plated razor like this goes a long way when it comes to longevity and durability. You can expect the blades to cut well and without irritating the sensitive skin of people. Compatibility with different brands of blades gives the razor bigger range to work with. I like the handle as it grants some weight and some form of stability to the razor head. The razor stand is a big plus. One can use it after the shave and cleaning the razor to good effect. The handle could have been textured for a better grip for the beginners in wet shaving. I am no expert but when it comes to disposable razors, the ideal one should tick several of your boxes. For any beginner, wet shaving is a mystery and so is a disposable razor. Naturally, people won’t know where and how to look at such a product. Well, luckily for you, I’m here to help. Many would go on a wordfight with me over whether it is important or not to look into the construction of a thing that you’ll throw away after five or six uses. I get that. But I’m in favor of checking out how each of my choices is made. Why? Because that impacts my shaving experience. For example, a plastic razor is lightweight. So, it’s easy to pick up and move around. However, as is the case with plastic razors, these things don’t pivot. They can’t adjust to the facial contours of men (and women). Moreover, they are fragile and can easily break apart. On the other hand, Metal razors are heavy. I’m trading off weight with longevity here. Also, a weighted handle can cut through coarse and ingrown hair like a knife on butter. Metal razors don’t grow old that easily. I’d pick these over plastic any day when looking at longevity. People have their choices when going for razors with one, two, three or more blades. Each has its own merit. However, they should consider the quality of these blades. For example, look into how sharp the blade point is. I look for any kind of guard that protects my blades from debris, moisture, and corroding. One might not realize but the best disposable razor must have the blade(s) set at an angle. Angular blades make it easy for the tool to shave our face. One can cut close and clean without much of an effort which is always a good news. Make sure buy a razor with 30-degree raised blade. Does “More Blades” Mean Good Shaving Experience? You are pretty close to hitting it home. Cartridge or disposable razors with multiple blades give you a closer shave than “Single-Blade” straight razors. That’s IF one knows how to handle them. Multiple blades are better at cutting through coarse and in-grown hairs too. However, makers of Multi-Blade razor heads often end up allowing too much space in between blades. 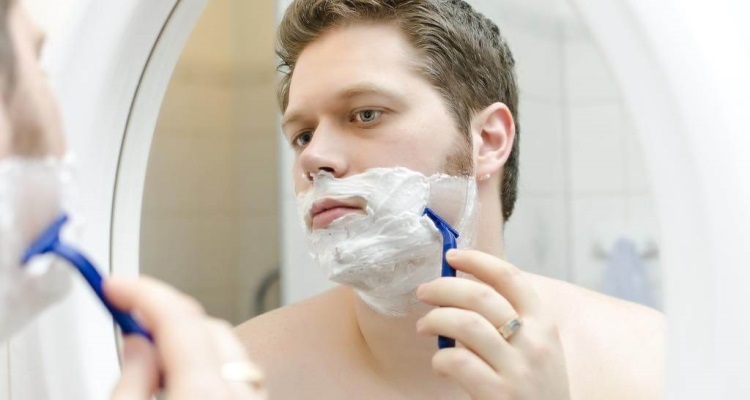 This can result in clogging of hair stubble, follicles, leftover skin, and so on. Cleaning them can be a bit of a “Task.” Without proper maintenance, blades can very quickly become dull as well. 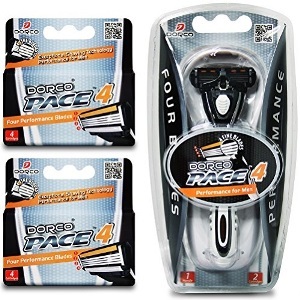 When choosing razors, make sure to look for ones that have a mechanism to properly clean these things like the six-blade razor system from Dorco Pace. Or go for single-bladed ones if you have no choices. Do We Need Lubricating Strips? In short, yes. Lubricating strips are great additions to a standard razor. These things provide moisture to your face while shaving. Lubricating agents can include anti-septic, moisturizers, cooling agents etc. When someone is looking to avoid nicks, cuts, and blood; these strips help. I know, many of the cheap disposable razors don’t have a lubricating strip. If you want the benefits of one, go for razor systems. Starting from Gillette, Dorco pace or Schick might be a good idea. Be sure to strengthen your wallet for the job. A “Quality” product should cost you as much. With common cartridge razors, we get a shaving tool with three or four refill blades. The beauty of their “Disposable” cousins is that they often come with a huge repertoire of blades. Buy a product and you’re secured for a year or more depending on how often you run beard maintenance. 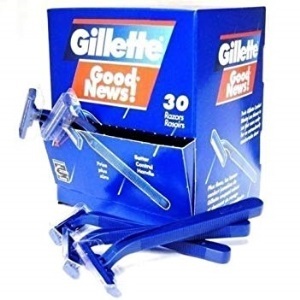 Franchises like Bump Fighter and Gillette offer 30 to 48 razors. Believe me, with 48 razors one can fuel shaving for two years or more. Additionally, these things are cheaper than other variants. You can get away with quality even after spending a fraction of an amount compared to what you had planned. Many of my readers might consider buying the best disposable razor a rocket science. If you get into this guide knowing little about the topic, the concept might get bolstered. Let me quell the thought in the bud. Buying these products isn’t so tough as people make it to be. Knowing about some top shelf brands and the products that they dish out is enough. For example, brands like Bic, Gillette, and Dorco Pace are ones that anyone can trust without batting an eye. People might argue that these brands are somewhat pricy. Yes, they are. But we’re in for a good product that takes care of our face. There’s no option to settle for anything less. Cheap products (in terms of quality) might cost you less money but the risks are far greater. My advice would be to consider your options and factor in the characteristics of the ideal razor. Whether it’s a recommendation or a reference point, this guide will cater to diverse readers of different needs all around the globe. Best Cartridge Razor to Root for in 2019 and Beyond!